Friends of the Margaret River Hospital celebrated the inauguration of a new palliative care ward on Thursday last week. The group, together with the local community, raised over $14000 for equipment and visual improvements including artwork, fresh paint, kitchen supplies and therapy oils. The ward will offer a homely and comfortable place for those who have to spend the last days of their lives in hospital. Saracen Estate performed superbly at the recent Winestate’s Best of Western Australia Awards 2012, with its Sparkling Maree 2009 winning “Top of Category”. Saracen’s Reserve Cabernet Sauvignon 2009 also received 5 out of 5 stars. Wines were blind-judged by a panel of veteran judges in their respective category. As well as the Best of the West Award 2012, Sparkling Maree 2009 also received a Gold Medal at the 2012 Winewise Small Vignerons Awards and a Blue Gold Medal at the 2012 Sydney International Wine Show. The Augusta Margaret River Shire Council has voted in favour of renaming the Busselton Airport to Busselton (Margaret River) Regional Airport. 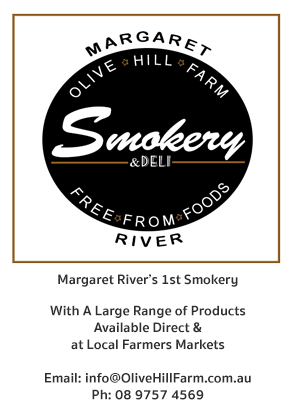 During a council meeting last week, Cr John Bell said that he believed Margaret River must be included in the name to appeal to the international market. Cr Lyn Serventy said that including brackets in the name would seem a bit odd, but “Margaret River does help sell it, so it does seem a good compromise.” The council will now advice the City of Busselton accordingly. A flash mob of dancers performed outside Margaret River Hotel last Thursday as part of an initiative entitled “ One Billion Rising” to raise awareness about violence against women. The mob consisting of young ladies danced to mark the V-Day, currently in its 15th year, which calls on one billion women across the globe to “dance, rise up and demand an end to this violence” at the same time. Members of Margaret River Lions Club joined Apex Margaret River Club members last Friday to mark the official inauguration of the playground located next to Margaret River Football Club. Those who attended the event had a great time mingling with friends and were treated to a barbeque tea. The playground is a joint project of Apex and Lions Club in conjunction with the Shire of Augusta Margaret River. The first round of the 2013 Margs Boardriders Junior Championship season started over the weekend in a superb style with 27 youngsters competing in 2ft. to 3ft. conditions at Huzzas in Gracetown. Divisions included Under10s, Under12s, Under14s and Under16s; Girls and Boys. A highlight of the event was the trip by Surfing WA Head Coach Mike McAuliffe who provided coaching on competitive surfing. The participants also enjoyed a beach BBQ, prepared by Russell English of Black Market Butchering.